Exercise capacity: a predictor of mobidity and mortality? In this paper by Diller et al. (2010, European Heart Journal 31, 3073-3083), the authors report the outcomes of 321 patients that underwent the Fontan procedure from 1997-2008 in four major hospitals in Europe. One of the major advancements of this study was that the authors not only recorded the fate of these patients but they also measured exercise capacity of these patients to see whether it affected their probability of dying, needing a heart transplant, or risk of hospitalization. This is an important advancement because recent studies have suggested that exercise capacity for patients with congenital heart defects (including those that have undergone the Fontan procedure) can be predictive of future survival as well as future medical issues. For example, in 335 adult patients with various congenital heart defects (average age 33 years), exercise capacity was much lower than other individuals of the same age and was actually similar to adult patients that had heart failure that was not caused by a congenital heart defect (Diller et al., 2005, Circulation). By exercise capacity, I mean maximal oxygen consumption (“VO2 maximum”) that is measured during a cardiopulmonary exercise test that takes place on treadmill. Other traits during exercise are also measured of course but VO2 maximum is thought to reflect the overall physical condition (especially cardiovascular condition) and capacity for physical exertion of an individual. For example, VO2 maximum is very high in endurance athletes like runners or cyclists. This early study by Diller et al. (2005) was surprising because many adult patients with congenital heart defects did not report to the investigators that they actually experienced limitation during exercise or other periods of physical exertion yet they clearly showed it in their depressed VO2 maximum values. In this study by Diller et al. (2010), the authors located 321 patients from Europe with various congenital heart defects that had the Fontan procedure 1997-2009 in 4 hospitals in Europe (German Heart Center in Munich, Royal Brompton Hospital in London, University Hospital in Bologna, and Great Ormand Street Hospital in London). They performed cardiopulomonary exercise testing to measure VO2 maximum and a variety of other characteristics reflecting exercise capacity during a standardized exercise trial on a treadmill. They followed these patients for an average of 21 months after exercise testing, though some patients were followed as short as <14 months and others >42 months. They recorded whether these patients were hospitalized, died, or underwent heart transplantation. 1) Exercise capacity (VO2 maximum) was not affected by whether patients had the lateral tunnel/intra-cardiac Fontan or the extra-cardiac Fontan. Though it is important to note that a formal statistical analysis was not presented here. 2) VO2 maximum during exercise testing was highly reduced compared to normal patients. As expected and other studies have found (see below), VO2 maximum during exercise was highly reduced compared to what would be expected for a patient at that same age without the Fontan procedure. Actually only <3% of patients had what would be considered a normal exercise capacity (VO2 maximum) based upon the calculations of the authors. 3) VO2 maximum was not significantly related to probability of death or need for heart transplantation but heart rate reserve was. Unlike previous studies (see below), VO2 maximum was not related to the probability of death or need for a heart transplant but patients with lower heart rate reserve (which is the peak heart rate during exercise minus the resting heart rate) had a higher chance of dying or needing a heart transplant during follow-up. However, it is important to note that relatively few patients died (22 patients out of 321) or needed a heart transplant (6 patients out of 321) so these comparisons might not be the best given you are comparing the physiological values of one very small group (28 patients) compared to another much larger group (283 patients). Also, when the authors compared patients that were followed for a minimum of 3 years, they found that there was no effect of exercise capacity on probability of death or need for cardiac transplantation. 4) Patients with low exercise capacity (low VO2 maximum, low heart rate reserve, etc.) were more likely to be hospitalized during follow-up. The authors found that 41% of patients were hospitalized for a heart related issue during the follow-up period. Those patients with low VO2 maximum during exercise testing and low heart rate reserve (again peak heart rate during exercise minus resting heart rate) were more likely to be hospitalized for a heart related issue during follow-up. This study by Diller et al. (2010) adds to the growing number of studies showing that patients with congenital heart defects that ALSO exhibit low capacity for aerobic exercise tend to fare poorly. For example, in separate studies using different patients, Diller et al. (2005) found that adult patients with low exercise capacity (low VO2 maximum) tended to be more likely to be hospitalized or die in the year following exercise capacity testing (see also Dimopoulos et al., 2006 Circulation 113, 2796-2802). In a later study but with a longer follow-up time after testing of exercise capacity (28 months after testing), those with low exercise capacity (again low VO2 maximum) had a higher probability of dying in the subsequent 28 months (Diller et al., 2006 J American Coll of Cardiology 48, 1250-1256). In this same study by Diller et al. (2006), the authors also found that patients whose heart rates didn’t respond appropriately to exercise (i.e., dramatically increase immediately following the start of exercise) had a higher probability of dying in the subsequent 28 months. These studies along with the results from Diller et al. (2010) that I discussed above strongly link the inability of the heart to perform properly during exercise for patients with congenital heart defects is unfortunately linked with an increased risk of future medical complications (reflected in increased hospitalization rates for heart related issues) or death. Obviously these results don’t suggest that a low VO2 maximum or low heart rate reserve or other marker of exercise capacity is equivalent to an increased risk of death for ALL patients. One question that I have based upon these studies is what is known about the effects of preventative care for patients with congenital heart defects? For example, to conclusively test that exercise capacity does in fact contribute itself to increased risk of death or hospitalization rather than simply reflecting overall poor condition, future studies would need to identify groups of patients with variable exercise capacity. If half of these patients did moderate and regular exercise like walking that might increase exercise capacity, would they fare better than the other half that did not engage in such moderate exercise? I don’t know but that would be interesting to identify if we can improve outcomes by increasing exercise capacity. The major goal here would be to see how we can increase exercise capacity and that has beneficial outcomes in the short- and long-term. Interestingly, recent studies where patients with the Fontan physiology were provided with sildenafil (viagra) showed increased exercise capacity (e.g., Giardini et al., 2008 European Heart Journal 29, 1681-1687). Obviously this needs much more study to understand the costs and benefits of administering sildenafil to patients with Fontan physiology. However, this is currently a promising and interesting start to understanding if increasing exercise capacity lowers the risk of hospitalization or probability of death. In this paper by Kumar et al. (2003, Ann Thorac Surg 76, 1389-1397), the authors compare the outcomes of patients that underwent the Fontan procedure either using the intra-cardiac (lateral tunnel) or extra-cardiac conduit method. I have previously discussed the differences of these two types of the Fontan procedure here. and how the use of each type has changed over time here. In brief, the intra-cardiac or lateral tunnel method is the ‘older’ method (introduced in 1987) and the extra-cardiac method was more recently developed (1990). 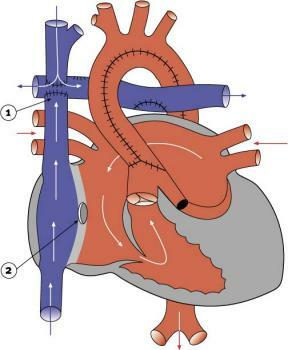 The lateral tunnel/intra-cardiac method involves sewing a piece of plastic inside the right atrium to route all blood from the lower part of the body (via the inferior vena cava) to the lungs whereas the extra-cardiac method involves placing a tube (either a tissue graft or plastic) outside the heart so that all blood from the lower part of the body (again via inferior vena cava) goes to the lungs. Regardless, some hospitals still perform the intra-cardiac method is the preferred option (see here). The first thing to point out that this study was published over 10 years ago and uses data from patients that underwent the Fontan procedure from 1995-2002. As I have discussed elsewhere, there have been significant improvements in patient care and outcomes from the Fontan procedure. The other issue that these authors indicate is that most institutions only use one of the types of Fontan or they have suddenly changed over time. As such, it is hard to compare the outcomes of a lateral tunnel vs. extra-cardiac Fontan at a single hospital over the same time period. This study presents data where they performed both lateral tunnel (37 patients) and extra-cardiac (33 patients) Fontan procedures at the same institution (Medical University of South Carolina) at the same time period. 1) Theoretical advantages of extra-cardiac method. The lateral tunnel or intra-cardiac method requires placing a piece of plastic (“baffle”) inside of the atrium. The lateral tunnel/intra-cardiac method has had good early, medium, and long-term outcomes as well in previous follow-up studies. However, this requires sewing the piece of plastic (Gore Tex) inside the heart, which may increase the risk of atrial arrhythmias. The extra-cardiac method avoids having to sew this piece of plastic inside of the heart and so a theoretical advantage is that this method may decrease risk of future heart rhythm issues. However, note that this generally requires that the surgery be performed later in life because you are placing a piece of plastic in the heart that will not grow with the patient. Another possible advantage of the extra-cardiac method is that it can allow surgeons to perform the procedure without aortic cross-clamping (where they prevent the blood from leaving the heart) and even without cardiopulmonary bypass, which may have some advantages for short- and long-term outcomes (discussed here). For example, in this study, aortic cross clamping was always used for the lateral tunnel/intra-cardiac method but used in ~51% of patients for the extra-cardiac method. 2) No difference in time on cardiopulmonary bypass between intra-cardiac and extra-cardiac method but patients undergoing intra-cardiac method were on aortic cross clamping longer than those using extra-cardiac method. Patients undergoing the lateral tunnel/intra-cardiac method were on bypass (mean = 134 min) nearly the same amount of time as those undergoing the extra-cardiac method (mean = 145 min). However, 100% of patients undergoing the lateral tunnel/intra-cardiac method had aortic cross-clamping and for a longer period of time (mean = 55 min) than those that had the extra-cardiac method (52% of patients, mean = 26 min). 3) No difference in time on ventilator, time in intensive care unit, duration of chest tube drainage, and hospital stay between those having the lateral tunnel/intra-cardiac method vs. those undergoing the extra-cardiac method. This is an interesting result given that the lateral tunnel/intra-cardiac method is theoretically supposed to improve short-term outcome (that soon after the surgery) because of decreased chest tube drainage, etc. However, here they didn’t find any differences between the two methods. 4) No difference in type or frequency of medications given to patients that underwent intra-cardiac vs. extra-cardiac Fontan ~3 years previous. Though this probably attributable to the hospital itself and how they treat their patients, most of the patients were on asprin (94%) and there were no other differences between the type of frequency of medications taken between patients that underwent intra-cardiac or extra-cardiac method ~3 years previous. 5) No difference in heart rhythm problems between patients that had underwent intra-cardiac vs. extra-cardiac Fontan at ~3 years after the surgery. This is somewhat surprising that 15% of patients that had underwent the intra-cardiac Fontan ~3 years previous had heart rhythm issues (sinus node dysfunction) whereas MORE (28%) of patients that had underwent the extra-cardiac Fontan had heart rhythm issues ~3 years previous. Although this is not statistically different, this is opposite than what would be expected. Two patients underwent permanent pacemaker implantation (1 lateral tunnel and 1 extra-cardiac method) and in one case for slow junctional rhythm. 6) No difference in the post-operative blood pressure in various parts of the atrium and in the Fontan pathway (“Fontan pressure” and transpulmonary gradient) between patients that underwent the intra-cardiac vs. extra-cardiac Fontan. The authors provide brief discussion how these pressures can be predictive of early Fontan failure but they found no difference between these two methods in the first 24 hours after the Fontan. Summary: This study highlights the lack of any real differences between the intra-cardiac/lateral tunnel vs. extra-cardiac Fontan in both the short- and long-term. This study also highlights the low rates of mortality or Fontan takedown (4.3%) around and soon after the actual surgery and high rates of survival 3-5 years after the Fontan for both the intra-cardiac (97%) and extra-cardiac (91%) methods. The authors discuss their results in light of other studies that were contemporary at the time of this publication (2003). There results are similar to those of Gaynor et al. (2001, J Thorac Cardiovasc Surg 121, 28-41) who reported results from patients undergoing either intra- or extra-cardiac Fontan at Children’s Hospital of Philadelphia (1992-1999) and who again found no real differences between the methods. However, in another previous study that did a similar comparison between patients that underwent the intra-cardiac or extra-cardiac method at the Hospital for Sick Children in Toronto (data from 1994-1998), there was a significantly higher incidence of heart rhythm problems for patients undergoing the lateral tunnel/intra-cardiac method (45%) than those that underwent the extra-cardiac method (15%) at the post-operative period. Why the differences? The authors indicate that it may come from how the Fontan procedure was staged. 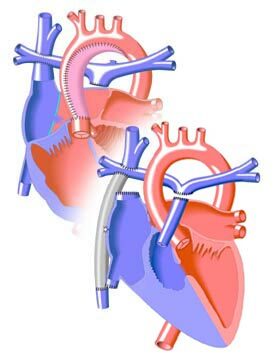 The second surgery prior to the Fontan is either the hemi-Fontan procedure or the bidirectional Glenn shunt. The authors indicate that they selectively perform the hemi-Fontan for patients that were to undergo the lateral tunnel/intra-cardiac Fontan and perform the bidirectional Glenn shunt for patients that are due to undergo the extra-cardiac Fontan. In contrast, the patients at the hospital in Toronto were all staged with the bidirectional Glenn shunt regardless of whether they were to undergo the intra-cardiac or extra-cardiac Fontan (well, all patients except 1). The authors discuss how the hemi-Fontan (2nd surgery) prior to the lateral tunnel Fontan is a preferred option than doing the bidirectional Glenn shunt prior to the lateral tunnel Fontan (as the surgeons in Toronto did) because the latter involves making incisions in the same area where the previous incisions for the bidirectional Glenn shunt were made. Cutting into the same places where previous incisions were made in the sinus node region is probably not a preferable option. Interesting result. These findings confirm other studies that the risk of heart rhythm issues is higher for patients that underwent the bidirectional Glenn shunt prior to the lateral tunnel/intra-cardiac Fontan than if they had underwent the hemi-Fontan prior to the lateral tunnel/intra-cardiac Fontan. I wonder if all hospitals now always do the hemi-Fontan before the lateral tunnel/intra-cardiac method now? Finally, the authors discuss how sometimes one method has to be done over another because of other issues with the heart anatomy. In other words, the choice of an intra-cardiac vs. extra-cardiac Fontan is not randomized among patients. For example, the lateral tunnel Fontan is often done for patients with hypoplastic left-heart syndrome but the extra-cardiac method is preferred for patients with heterotaxy syndrome. This makes it difficult to assess whether the short-, medium, or long-term outcomes are a result of the surgical procedure itself (i.e., which Fontan method) or the actual underlying condition. In this paper by Drs. James H. Moller and Ray C. Anderson (The American Journal of Cardiology, 2013, in press, see link below), the authors followed the survival of 994 patients with various congenital heart defects that were evaluated in 1952-1963. These patients were seen by these doctors early in life (infancy or childhood) and then they were followed into adulthood, which is now a time period of 43-54 years! The authors have published similar follow-up studies in the past such as a follow-up ranging from 26-37 years following the initial diagnosis. This study is not an experiment but simply an observational study where they simply measure various health metrics at regular checks. It may be helpful in predicting what trajectory your child or adult might follow depending upon their condition but remember that in this study, these children were diagnosed in 1952-1963. Luckily for children born more recently that have similar heart defects today, their treatment and diagnosis may be much more advanced and refined than the children that were diagnosed in 1952-1963. I enjoy these types of ‘follow-up’ papers because they help to remove some of the cloud of confusion or lack of clarity on the future for children born today with congenital heart defects. As the authors indicate, it is surprising and encouraging that ~64% of these patients that were born from 1952-1963 were still alive >50 years after their initial diagnosis. This is encouraging because we can only hope that the treatment for children with the same conditions that are born today will have even higher probabilities of survival due to improved and refined treatment. These types of papers are also important for parents with children with congenital heart defects as well as adults living with congenital heart defects because they demonstrate the importance of voluntarily enrolling in such follow-up studies so that more data and patterns can be identified. 1) Around 63% of patients were alive almost 50 years later and risk of death declines after surviving first 10 years of life. This study was based at the Departments of Medicine and Pediatrics at the University of Minnesota in Minneapolis. The authors report information about survival from 994 patients that were diagnosed with a congenital heart defect from 1952-1963. Of these 994 patients, 63.6% (632) were alive as of 31 December 2006 (apparently the date of the last evaluation). For those patients that had died, most of the deaths (57.7% or 209/362 patients) occurred in the first 10 years of life with many (34.5% or 125/362 patients) occurring in their first year of life. For those that survived past 10 years of age, the rate of death was relatively equal for patients in their 20’s, 30’s, 40’s, 50’s, and 60’s (7-10% died in each decade of life). Although it would be preferable to have even lower rates of death, it is interesting to note that the rate of death is about equal for those that reached 20 years of age. 2) Around 1/3 of patients died from cardiac issues. The authors report the cause of death for 130 adult patients (I think this means those that survived until at least 20 years of age, though this is not clear). Perhaps importantly, 40% of these deaths were from non-cardiac issues (cancer, accidents, diabetes, suicide, etc.). For those patients that died through cardiac issues, sudden death was the most common cause (~27%) with congestive heart failure, death while waiting for heart transplant, myocardial infarction (heart attach), cardiac reoperation, etc. having similar frequencies. 3) The probability of survival from birth to 10, 20, 30, 40, 50, 60 years of age was markedly lower for patients that are cyanotic (low oxygen saturations). How cyanosis was measured and the cut-off for the cyanotic group versus the other group is not clear to me. 4) Patients with only a ventricular septal defect, patent ductus arteriosus, or an atrial septal defect (no other condition) actually had a similar probability of survival to normal patients from 0-60 years of age. However, patients that had one of these three conditions plus another defect (not clear what they mean by ‘other anomalies’ here) had a much lower probability of survival from 0-60 years of age.